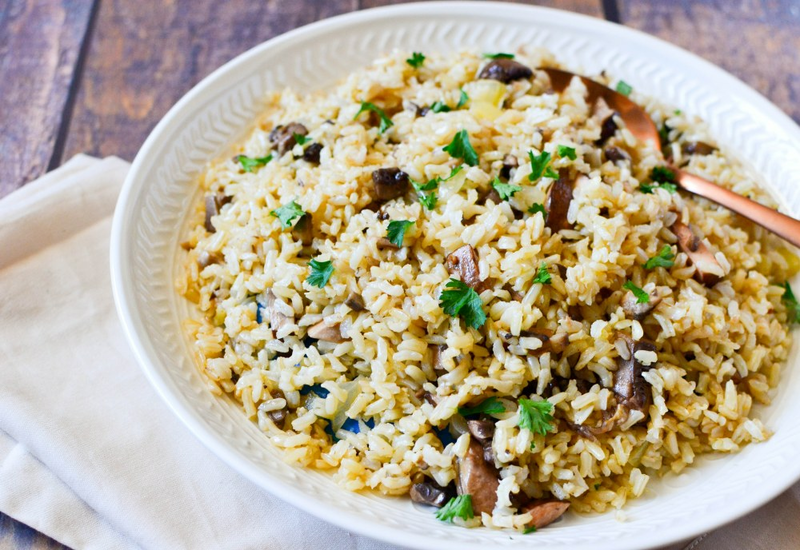 Packed with cremini, button, and shiitake mushrooms, this simple and hearty rice dish is full of great umami flavor. It's also very simple to make, with a cooking time of under 30 minutes. Using three different types of mushrooms adds complexity and varying textures, accented by fragrant onion and garlic. A pinch of turmeric adds a hint of Middle Eastern flavor. Serve this savory pilaf alongside roasted chicken or meat for a hearty fall or winter dinner, or with sautéed salmon or scallops for a lighter meal. Alternatively, it makes a delicious vegetarian main course when topped with a poached egg. For a heartier dish, try this preparation with your favorite whole grain, such as farro, quinoa or barley. You could also try long grain brown rice for more nutrients. If you have access to good quality wild mushrooms, feel free to substitute them and try different combinations. Per Serving: 187 calories; 8g fat; 21.2g carbohydrates; 5g protein; 3mg cholesterol; 207mg sodium. This is a really good rice pilaf the makes for the perfect side dish to dinner, including holidays and casual gatherings. I love the fragrant mushrooms, it was very delicious and simple to prepare. Very good mushroom rice pilaf. The cremini mushrooms, white mushrooms and shiitake work great together! I never think to use all three, so glad I did. Delicious. Rice pilaf makes a regular appearance at my house. It's a simple recipe that will add some flavor to plain rice. This recipe is timeless and classic. I subbed out chicken stock for vegetable broth, and didn't use any turmeric. I used cremini mushrooms only and really like the way it turned out, lots of really delicious flavor. If you like mushrooms you will love this recipe. Super simple side dish to make with chicken. I cut the amount of mushrooms used in half and subbed chicken stock for vegetable stock. It's an easy recipe that makes a great side dish for Sunday dinner.